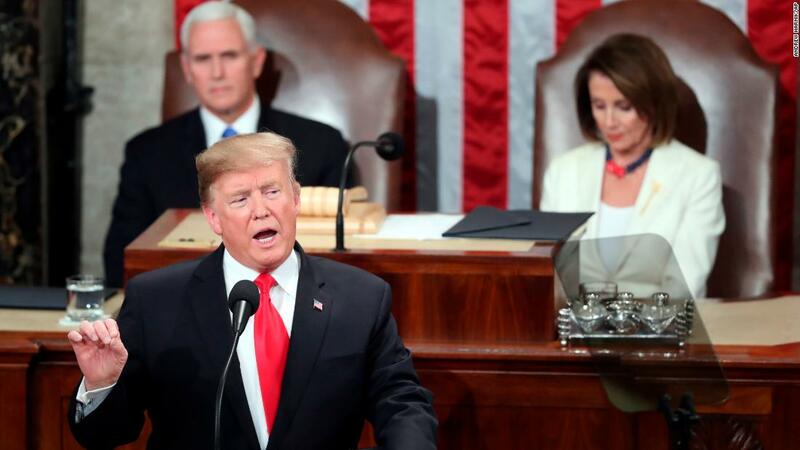 President Donald Trump delivered his 2019 State of the Union address on Tuesday. Read the President’s speech as prepared for delivery and released by the White House. In June, we mark 75 years since the start of what General Dwight D. Eisenhower called the Great Crusade — the Allied liberation of Europe in World War II. On D-Day, June 6, 1944, 15,000 young American men jumped from the sky, and 60,000 more stormed in from the sea, to save our civilization from tyranny. Here with us tonight are three of those heroes: Private First Class Joseph Reilly, Staff Sergeant Irving Locker, and Sergeant Herman Zeitchik. Gentlemen, we salute you. But we must reject the politics of revenge, resistance, and retribution — and embrace the boundless potential of cooperation, compromise, and the common good. In just over 2 years since the election, we have launched an unprecedented economic boom — a boom that has rarely been seen before. We have created 5.3 million new jobs and importantly added 600,000 new manufacturing jobs — something which almost everyone said was impossible to do, but the fact is, we are just getting started. We eliminated the very unpopular Obamacare individual mandate penalty — and to give critically ill patients access to life-saving cures, we passed right to try. We have unleashed a revolution in American energy — the United States is now the number one producer of oil and natural gas in the world. And now, for the first time in 65 years, we are a net exporter of energy. On Friday, it was announced that we added another 304,000 jobs last month alone — almost double what was expected. An economic miracle is taking place in the United States — and the only thing that can stop it are foolish wars, politics, or ridiculous partisan investigations. This new era of cooperation can start with finally confirming the more than 300 highly qualified nominees who are still stuck in the Senate — some after years of waiting. The Senate has failed to act on these nominations, which is unfair to the nominees and to our country. And just weeks ago, both parties united for groundbreaking criminal justice reform. Last year, I heard through friends the story of Alice Johnson. I was deeply moved. In 1997, Alice was sentenced to life in prison as a first-time non-violent drug offender. Over the next two decades, she became a prison minister, inspiring others to choose a better path. She had a big impact on that prison population — and far beyond. Alice’s story underscores the disparities and unfairness that can exist in criminal sentencing — and the need to remedy this injustice. She served almost 22 years and had expected to be in prison for the rest of her life. In June, I commuted Alice’s sentence — and she is here with us tonight. Alice, thank you for reminding us that we always have the power to shape our own destiny. Meanwhile, working class Americans are left to pay the price for mass illegal migration — reduced jobs, lower wages, overburdened schools and hospitals, increased crime, and a depleted social safety net. Tolerance for illegal immigration is not compassionate — it is cruel. One in three women is sexually assaulted on the long journey north. Smugglers use migrant children as human pawns to exploit our laws and gain access to our country. Tens of thousands of innocent Americans are killed by lethal drugs that cross our border and flood into our cities — including meth, heroin, cocaine, and fentanyl. I’ve gotten to know many wonderful Angel Moms, Dads, and families — no one should ever have to suffer the horrible heartache they have endured. Special Agent Hernandez, please stand: We will always support the brave men and women of Law Enforcement — and I pledge to you tonight that we will never abolish our heroes from ICE. It includes humanitarian assistance, more law enforcement, drug detection at our ports, closing loopholes that enable child smuggling, and plans for a new physical barrier, or wall, to secure the vast areas between our ports of entry. In the past, most of the people in this room voted for a wall — but the proper wall never got built. I’ll get it built. This is a smart, strategic, see-through steel barrier — not just a simple concrete wall. It will be deployed in the areas identified by border agents as having the greatest need, and as these agents will tell you, where walls go up, illegal crossings go way down. The border city of El Paso, Texas, used to have extremely high rates of violent crime — one of the highest in the country, and considered one of our Nation’s most dangerous cities. Now, with a powerful barrier in place, El Paso is one of our safest cities. No one has benefitted more from our thriving economy than women, who have filled 58 percent of the new jobs created in the last year. All Americans can be proud that we have more women in the workforce than ever before — and exactly one century after the Congress passed the Constitutional amendment giving women the right to vote, we also have more women serving in the Congress than ever before. To build on our incredible economic success, one priority is paramount — reversing decades of calamitous trade policies. Therefore, we recently imposed tariffs on $250 billion of Chinese goods — and now our Treasury is receiving billions of dollars a month from a country that never gave us a dime. But I don’t blame China for taking advantage of us — I blame our leaders and representatives for allowing this travesty to happen. I have great respect for President Xi, and we are now working on a new trade deal with China. But it must include real, structural change to end unfair trade practices, reduce our chronic trade deficit, and protect American jobs. I have met the men and women of Michigan, Ohio, Pennsylvania, Indiana, New Hampshire, and many other States whose dreams were shattered by NAFTA. For years, politicians promised them they would negotiate for a better deal. But no one ever tried — until now. Our new U.S.-Mexico-Canada Agreement — or USMCA — will replace NAFTA and deliver for American workers: bringing back our manufacturing jobs, expanding American agriculture, protecting intellectual property, and ensuring that more cars are proudly stamped with four beautiful words: made in the USA. I know that the Congress is eager to pass an infrastructure bill — and I am eager to work with you on legislation to deliver new and important infrastructure investment, including investments in the cutting edge industries of the future. This is not an option. This is a necessity. The next major priority for me, and for all of us, should be to lower the cost of healthcare and prescription drugs — and to protect patients with pre-existing conditions. Joining Melania in the gallery this evening is a very brave 10-year-old girl, Grace Eline. Every birthday since she was 4, Grace asked her friends to donate to St. Jude Children’s Research Hospital. She did not know that one day she might be a patient herself. Last year, Grace was diagnosed with brain cancer. Immediately, she began radiation treatment. At the same time, she rallied her community and raised more than $40,000 for the fight against cancer. When Grace completed treatment last fall, her doctors and nurses cheered with tears in their eyes as she hung up a poster that read: “Last Day of Chemo.” Grace — you are an inspiration to us all. To help support working parents, the time has come to pass school choice for America’s children. I am also proud to be the first President to include in my budget a plan for nationwide paid family leave — so that every new parent has the chance to bond with their newborn child. Let us work together to build a culture that cherishes innocent life. And let us reaffirm a fundamental truth: all children — born and unborn — are made in the holy image of God. Over the last 2 years, we have begun to fully rebuild the United States Military — with $700 billion last year and $716 billion this year. We are also getting other nations to pay their fair share. For years, the United States was being treated very unfairly by NATO — but now we have secured a $100 billion increase in defense spending from NATO allies. We stand with the Venezuelan people in their noble quest for freedom — and we condemn the brutality of the Maduro regime, whose socialist policies have turned that nation from being the wealthiest in South America into a state of abject poverty and despair. Our approach is based on principled realism — not discredited theories that have failed for decades to yield progress. For this reason, my Administration recognized the true capital of Israel — and proudly opened the American Embassy in Jerusalem. I have also accelerated our negotiations to reach a political settlement in Afghanistan. Our troops have fought with unmatched valor — and thanks to their bravery, we are now able to pursue a political solution to this long and bloody conflict. In Afghanistan, my Administration is holding constructive talks with a number of Afghan groups, including the Taliban. As we make progress in these negotiations, we will be able to reduce our troop presence and focus on counter-terrorism. We do not know whether we will achieve an agreement — but we do know that after two decades of war, the hour has come to at least try for peace. Above all, friend and foe alike must never doubt this Nation’s power and will to defend our people. Eighteen years ago, terrorists attacked the USS Cole — and last month American forces killed one of the leaders of the attack. Just months ago, 11 Jewish-Americans were viciously murdered in an anti-semitic attack on the Tree of Life Synagogue in Pittsburgh. SWAT Officer Timothy Matson raced into the gunfire and was shot seven times chasing down the killer. Timothy has just had his 12th surgery — but he made the trip to be here with us tonight. Officer Matson: we are forever grateful for your courage in the face of evil. I began this evening by honoring three soldiers who fought on D-Day in the Second World War. One of them was Herman Zeitchik. But there is more to Herman’s story. A year after he stormed the beaches of Normandy, Herman was one of those American soldiers who helped liberate Dachau. He was one of the Americans who helped rescue Joshua from that hell on earth. Almost 75 years later, Herman and Joshua are both together in the gallery tonight — seated side-by-side, here in the home of American freedom. Herman and Joshua: your presence this evening honors and uplifts our entire Nation. Why did they do it? They did it for America — they did it for us. Everything that has come since — our triumph over communism, our giant leaps of science and discovery, our unrivaled progress toward equality and justice — all of it is possible thanks to the blood and tears and courage and vision of the Americans who came before. Think of this Capitol — think of this very chamber, where lawmakers before you voted to end slavery, to build the railroads and the highways, to defeat fascism, to secure civil rights, to face down an evil empire. What will we do with this moment? How will we be remembered? I ask the men and women of this Congress: Look at the opportunities before us! Our most thrilling achievements are still ahead. Our most exciting journeys still await. Our biggest victories are still to come. We have not yet begun to dream. We must choose whether we are defined by our differences — or whether we dare to transcend them. We must choose whether we will squander our inheritance — or whether we will proudly declare that we are Americans. We do the incredible. We defy the impossible. We conquer the unknown. This is our future — our fate — and our choice to make. I am asking you to choose greatness. Thank you. God Bless You, God Bless America, and good night! Secrets that will help bend your subconscious mind to your will. Learn how to read music in as little as one evening about 4 hours by learning the 3 basics. A multimedia ebook on how to read ledger line notes easily and quickly. Discover the secret method to gain the complete command over the human mind. Get a real-time detailed vehicle history report from our nationwide database. Web Siphon Professional Edition With Advanced Features and Unlimited Sites License Powerful New App That Allows You To Rediscover The Web With Drag and Drop Ease To Automate, Post and Profit From Viral Images, VIdeos, Articles and Quotes For Massive Amounts of Traffic, Leads and Sales Like Clockwork! Store Buildr - The Plumbing Mega Store The Ultimate ‘Done For You’ Niche Website Store! My Unfair Advantage - Special Blow Out $297. Omar and Melinda Martin's highly regarded flagship product has everything a marketer needs under one roof. This membership site includes LIVE weekly coaching webinars and hundreds of archived episodes. Includes access to core products for free! 8 Shares In The MTC Coop - Member Special Start Getting Easy Traffic To Your Online Offers On 100% Autopilot In As Little As 3 Minutes, Guaranteed! SocialLeads The Next Generation SAAS Platform For Lead Capture. WebinarHD Agency 200 The Best Webinar Software That Will WOW Your Audience During LIVE Facebook Stream Using Dynamic Layouts. Social Traffic Jacker FE 47 100% Automated targeted social media traffic jacking. Store Buildr - Shape Your Future With Yoga The Ultimate ‘Done For You’ Niche Website Store! PicEngage 1-Click Software Lets You Put Buy Buttons, Opt-In Forms and Videos Right on Top Of Images - Resulting in a 300% increase in revenue! Ad Ignition Software [Start-Up] Create and Run Amazing Interactive Ad Campaigns on All Your Websites and Control them All from One Easy to Use Dashboard! One Time Hosting Ruby Domain Bundle 6 One Time Hosting Ruby Domain Bundle with 6 lifetime domains with lifetime privacy. Ad Ignition Software [Alpha Monthly] Ad Ignition Software Alpha Package including Profit Academy Coaching Program, Agency License and Free Easy Graphics Wizard Account.